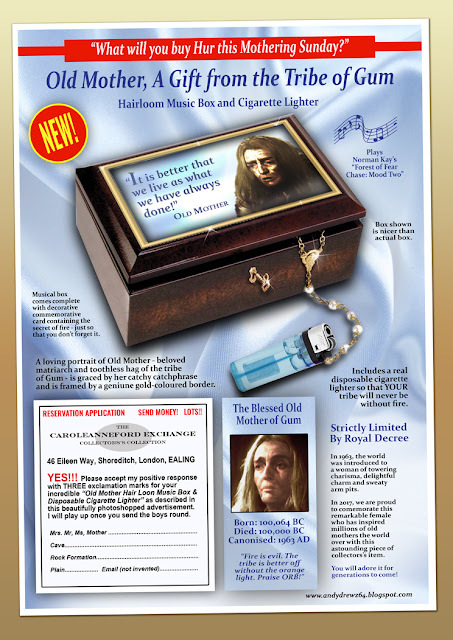 Andydrewz's Pages: Introducing the Old Mother Collectors's Music Box and Cigarette Lighter! Introducing the Old Mother Collectors's Music Box and Cigarette Lighter! Occasionally, someone suggests an idea so amusing I have to drop everything I'm doing and power up the mac for a quick Photoshop session. This is one such idea. Sadly it meant that my living room carpet had only been half-shampooed by 10pm this Sunday evening. 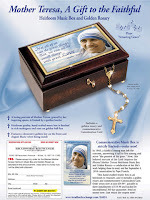 Paul Lang posted the ad (for a Mother Theresa music box) on Twitter and Clayton Hickman suggested the Old Mother (from TV's Doctor Who and 100,000BC) angle. Oh and thanks to @ShaunoHammer for the inspired strapline!